Churros are one of the most famous desserts in the world given their sweet and crunchy taste that leaves the consumer always wanting more! What is it about Churros that we love so much? Perhaps it is in their perfect warm temperature that goes ideally with a warm chocolate sauce or their intense cheese and fruit fillings that vary according to geographic location. Regardless of the reason, the Churro is one of the most debated desserts in the culinary industry due to its complicated family tree that exists in a plethora of cultures around the world. 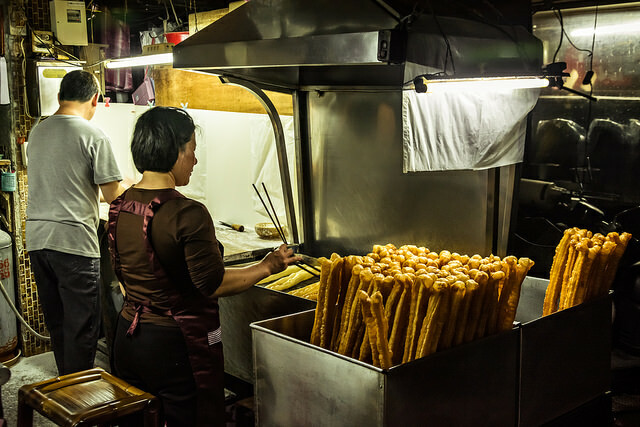 Youtiao (otherwise known as the Chinese doughnut) is a common breakfast item in China and can also be purchased at various street vendors. It is a fried a breadstick which is often lightly salted on top for an extra delightful burst of flavour. Typically, Youtiao is accompanied by rice congee, soy milk or regular milk blended with sugar during breakfast time. Regardless of where the Churro in fact was created, the Conquistadors of Spanish and Portuguese descent are credited with bringing the Churro to Latin America. After traveling across the ocean the recipe of this delicious dessert achieved many different reinventions throughout the ages that even made it to my grandmother’s kitchen. Nowadays every country has its signature recipe, where the flavour of the Churros is enhanced with exotic fillings. For example, the Churro is filled with guava in Cuba due to the availability of sensational fresh tropical fruits in the Caribbean. 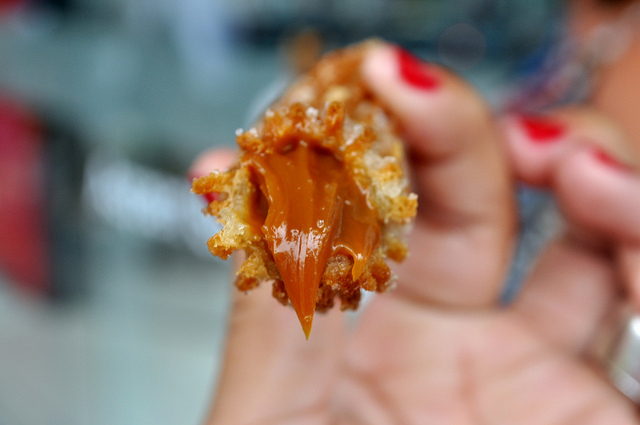 In Mexico, Chile and Argentina the Churro is often served filled with a rich caramel sauce called Dulce de Leche that goes quite well with an espresso after dinner. In my travels to Uruguay, I saw a distant cousin of the Churro that had a cheese filling inside that was quite delicious as an appetizer as well. Returning to the Churro’s Iberian roots in Spain, one of the best traditions to find a Churro in Spain is to take an evening walk in Madrid near the Plaza Mayor. On the corner of the Plaza Mayor at the Chocolatería San Gines, one can find one of the best Churros in the world that comes with their very own warm chocolate dipping sauce. 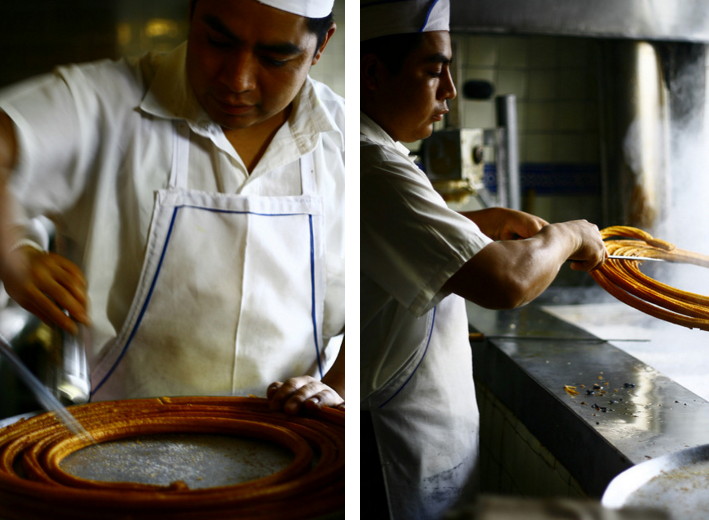 In Central and South America Churros are mostly sold (and taste the best) by street vendors. 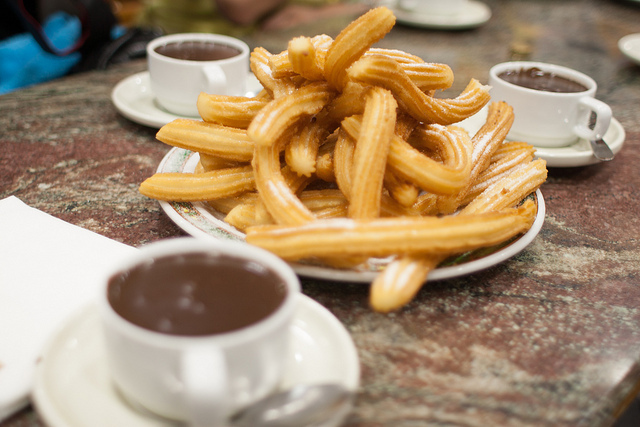 Today, the Churros have also become a popular treat in the US and Europe at the markets and street fairs. The recipe of the Churros might vary significantly from kitchen to kitchen. However, the essence of the Churro as most people know it consists of a spiral-shaped or straight fried pastry dough that has a dust of cinnamon sugar on top that is heated to just the right degree of warmth.If you would like to recreate the Spanish recipe in your own home, it is quite simple to achieve in roughly 40 minutes of preparation, which makes it an ideal treat for a dinner party. Take a look at our version of the Churro recipe here! Regardless of which Churro style and recipe you end up choosing for your upcoming party or meal, remember that the key to success is in preparing the dough. If you execute this step properly, the cinnamon, sugar and potentially filling or dipping sauce are merely an accent to a sensational dessert. Just remember to take a big bite and enjoy your delicious cultural creation that has quite the controversial history!